I've not been to Cuba. My friend Glenn has, several times, in connection with his work for CDI and such. I've taken to crafting a brand of science fiction that's rather close to investment banking in some ways, and Cuba appears in that, growing its ties with the European and Canadian firms that have a slice of the US economy as well. This file was itself distributed by Mongrel Media, which is more aimed at Canadians than Movie Madness in Portland, but DVDs get around. 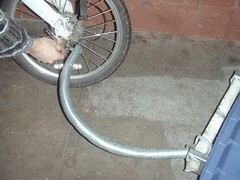 First Run Features is also a distributor. I'm motivated to see other Estela Bravo documentaries. She gets talking heads you don't see in just any documentary. Philip Agee, Angela Davis... Harry Belafonte, and of course Fidel himself, speaking candidly with the director (not a screen presence). We also get great footage of Nelson Mandela, Ted Turner, Mikhail Gorbachev, Nikita Khrushchev, Mike Wallace, Jack Nicholson, Malcolm X, the Pope and many others. Lots of Che. When it comes to having a front row seat on history in the making, Fidel has that "box of chocolates" guy beat (hello Tom Hanks), without being such a drifter. He's a world leader we've been lucky to have in many dimensions, making the 1900s a little less of a nightmare. Like Muhammad Ali, Fidel was seriously disappointed he didn't get to meet Ho Chi Minh, though he did get to Vietnam, against which USA presidents were squandering lives, as prisoners of collective fantasies. Islands have different dynamics than vast contiguous landmasses, like continents. Always speaking of the USA as "a giant" to the North reinforces this sense of a monolith, but that's largely an illusion of statism. As Roger Paget was pointing out at Wanderers, shipping patterns have changed in Indonesia to where no one port controls all the others (a new pattern). Statism is giving way to more organic evolutionary patterns in many dimensions. We go around the embargo by importing web site bits. Relations with Cubans is a proposition Oregonians are free to explore independently of New Yorkers or citizens in the District of Columbia or Guam (both non-states). There's some irony in having the highly interconnected space of private companies (with private jets) re-shaping capitalism and doing social engineering at the same time. I'm interested in building Portland's reputation as a source of anime and manga, and see the University of Havana as a possible ally in this regard. Cuba is well positioned to stay a trusted brand in ecologically aware tooling and investing, as well as schooling, medical care and disaster relief (lots in common with Portland). We shall see. I missed Glenn's presentation at Wanderers, owing to the serious leak in my upstairs bathroom, and my needing to work with Mick the plumber. I was pleased to learn that Nirel had contributed her professional services and recorded the proceedings. I'm hoping to catch it on Youtube one day soon. For you Lindsey fans out there who check these blogs mainly to find out about her, I am pleased to report she's blissing out with her drum machine. Some complain drum machines are soulless, but that might be said about any instrument. She's made check lists of all the features and made sure to use each one. She has researched the lore connected with this model, including about the machines emulated within. Her research helped me decipher the reference to "808" in that Boom Boom Pow number. The 808 was a drum machine. Her nickname for this machine is R2 (as in R2D2) and she loves it dearly. Her process is to create drum tracks for three entire albums before going back to add keyboard and vocal tracks. This is what's going on in my basement, amidst the occasional flooding or rat visitation. This is my first posting from the new work computer, a Macbook Air, pretty sleek. I don't have the reflexes for this machine yet, POSIX-based though it may be. I'm liking it though, and plan to be a quick study. I've got a couple vids from Movie Madness to take in, one on Fidel, the other on birds. More details later. Proving I'm a USA citizen is the new language game. I've got another I-9 to do, but in setting aside my expired passport and SSN, I think I might have pushed them off the radar. The current plan is to show up at the Social Security office downtown on Monday with my driver's license. It looks that that might work, in which case I can meet the deadline and FedEx the forms, per Kathleen's request. Lindsey is a huge popcorn fan, with or without the videos / movies. She jumped into this pose as a statement of her approval, half in spoof of herself for so doing. 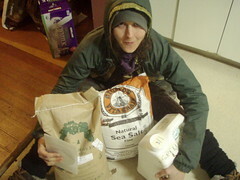 That's a 25 pound bag of popcorn on the left, sea salt, and oil. The basic ingredients of life. 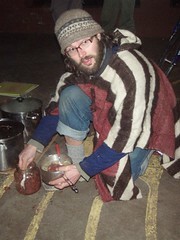 Simon was offering some of his accumulated stuff as giveaways at Colonel Summers Park last night. 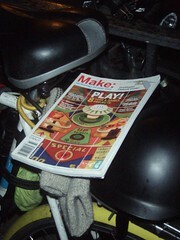 I grabbed a Make: magazine. He said he once had a whole collection of those. 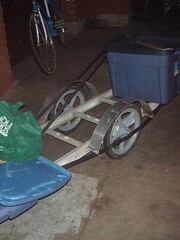 His DIY bike trailer, made from a ladder, with a custom hook, is paradigm DIY in my book. Simon lives the dream, as do many on this FNB circuit. I'm continuing to weave a story wherein two of my favorite philosophers, Bucky Fuller and Ludwig Wittgenstein, get to share top billing as "transcendentalists" which, in this case, means both place a high value on intuition, but also on self-discipline. You get the most out of your inner genius if you train your reflexes, or allow them to be trained, like an athlete, as that-of-God within (or call her Athena) may ask for leaps, as well as bounds. Having this world class library of books by and about both of these guys certainly works to my advantage. But then the trouble with books is when do we have the time to read them? Mostly we need them assigned, or want to have them read for upcoming discussions. Having some common currency, some concepts in common, is what culture is all about, popular culture but also high culture if we care to make the distinction. As I was explaining to readers on Sean's list, in my case it helps to have Alex to report back to. He has really done his homework pretty well, is someone I have no trouble looking up to when it comes to sharing views, yet he's currently too invested in various self disciplines to have the time to just sit around reading philosophy books, appealing as that may be. I don't have oodles of time either, but as the books are right here in the Blue House, it's a lot easier for me than it is for him. More specifically, both philosophers emphasize that understanding the parts involves having a sense of the whole, and there's a changing sense of the wholeness that has profoundly existential dimensions. One may speak of a waxing and waning that colors one's whole world, making it more or less nauseating, or enchanting, or what have you. Also, both philosophers develop their meanings operationally, meaning through use in context within invented language games and namespaces, with an emphasis on non-linear readings anticipatory of today's "hypertext". Both philosophers tended to number their paragraphs and write aphoristically, knowing their remarks made sense in many different orders, in what could be called networks. A sense of nodes and edges pervade the reading, ergo a sense of their topology, identified by Fuller with "systems" (as in "systematic thinking") with a tetrahedron of six edges and four nodes serving as his "minimum system". Fuller developed intelligible meanings for "brain" and "mind", not wasting them as mere synonyms. He kept a dramatic tension going between them. The former might "disconnect" from the latter, resulting in what Otto Weininger might have called "a criminal state of mind in a dog-eat-dog world" (a despairing hell of nail biting terror, shall we say). Reconnecting with one's higher self, or, if connected, staying connected, was the heroic responsibility of a philosopher, or the routine responsibility of a cosmic janitor, depending on one's perspective. In either case, a life of the mind was preferable, and Wittgenstein seriously agreed with this judgment. Salvation / liberation was sought through some eternal eye of the needle. Logic or grammar, rightly exercised, might help pinpoint it, but you would have to go through it on your own (an act of will, a doing more than a seeing). The doors to new perceptions keep opening. The act of eternally passing through them leads away from dead ends. I've been inspired to get the Blue House added to some circuit of academic value to people, like a school of some kind. Calling it the Global U is rather vague, while in the meantime I've been dissing some of the better known name brands, being polemical. My Global Data Corporation, designed from the ground up to be Grunch-like, was similarly difficult to instantiate, though as a campus facility, I'd say the Blue House has done a fine job of it. The only real company I sometimes work in is Unilever, in connection with the Pauling House Campus, and CBS, in my thoughts about television, along with Python.TV and some other stuff (including Disney). How does any of this jibe with Rad Math and Martian Math, ostensible products of said residential zone establishment? That would be the Oregon Curriculum Network and my "mechanized logic division" through work, and also through Saturday Academy (an occasional gig). Various Internet groups. Conferences. Nothing especially new. Same old same old. I traveled northward alone this time, an away team of one. My destination: a memorial service for Eve Talmadge, my dear relative, by way of an old haunt, a place to park, sleep, unwind. Some of the chatter after the service revolved around Cantwell, near where Lee works in Alaska. There'd been some kind of propane buildup in the Chevron station and the place had blown. Investigators and insurance people would need to figure out what happened in order to help with the medical expenses of the injured. There's no concept of no fault medical coverage. Evelyn's parents ran Mercer Island's first gas station along its first paved road, connecting a ferry on the Seattle side to a bridge on the Bellevue side. Hap, her dad, was killed in a car accident, as was my dad. She became a nurse and continued to nurture her talents for music and painting. Evelyn raised her family in Ohio with her first husband, who became a professor at Kent State. Later in life, she met John Talmadge. She and John were very connected to the life and times of Bellingham, Washington, were this service took place. Tara stayed behind with the three women and the dog, working on college essays. Snow played a role in my adventures. I saw quite a few accidents, though none seemed really serious. As a long time member of the Oversight Committee, I like to encourage Friends to see Meeting for Worship as the unique opportunity Friends offer, both to themselves and droppers in. Some churches may give the impression of these masterful "life fixers" within the core, who will take new recruits under their wing, show them the ropes, and set them on a new path. That's a nice projection, but with Friends it's really in meditation (as some might call it), in worship (also called "expectant waiting") that answers well up in a form unique to the individual, comprehensible yet private. Don't expect it (the answers to your prayers) to come as direct advice from some "advanced Quakers" who are "clear" (that's more the Scientologist model maybe). Seek wisdom from within the community, certainly, but don't imagine there's a fix-it-all core clique of Bodhisattvas -- or go ahead and imagine it (some projections are healthy), but then make sure you include yourself as "one of them", as inner circle, so you don't make a pest of yourself trying to "break in". Some young folks just stopped by in a car and grabbed some of the free pile stuff Lindsey set out this morning. The girl was happy to get some shoes. I'll be missing the memorial service for Ardelle Dennis tomorrow, as I'm planning to be on my way to another service for my Aunt Eve, daughter of my grandmother Esther's sister Elsie, sister to Bill, Howard, Bo and Ed. These are the Swedes on my dad's side of the family. You won't find all Quakers using the word "meditation" for their practice, but there's enough of a bridge literature to provide that Asian-sounding spin in translations. That some local yokels would hit upon such a style in the tumultuous 1600s is all the more amazing, and that a branch would follow one Penn to a so-called New World (or New Atlantis if Baconian), had a big downstream effect on the future of the new nation later established (in 1776 by convention). Ardelle and her family were contemporaneous with mine in the early days of Multnomah Meeting. Hazel Hemphill was among us. Sonya Pinney and Bob Smith remember those days. Then our family moved to Rome where my dad had found work as an urban and regional planner for the fledgling North African state of Libya. He later worked as a planner for the Philippines, Egypt, Bangladesh, Bhutan and Lesotho, although sometimes more on the education planning side, a more specific focus. I didn't return to Portland until my late twenties. Multnomah Friend David Lansky was working for Ecumenical Ministries at the time, and helped me get on board with the Center for Urban Education, where I started my career as a teacher of computer-related subjects, a career that continues to this day. I've been diving into this Wittgenstein Reads Weininger tome, by Stern and Szabados, an anthology. Alex found it and graciously let me dig in. He's more into meditating these days, takes these things in chapters. I understand. Movie Night at the Blue House (private party format) featured the season premier of Portlandia, and the great movie Being There with Peter Sellers. Lindsey wasn't sure how to take the "pickle anything" joke, as she does take that attitude, felt targeted. Portlanders are generally cheered by this show though. Spoofs not bombs. Everyone loved Being There. Jack Warden has aspects of Gene Hackman, as does MacLaine of Jane Fonda. I've been channeling more of the day to day stuff to FaceBook of late. This may have to do with the thread I've been weaving on the Wittgenstein list, a thread I'm about to extend. Alexia, Alexia's David, Tara and I met at Than Thao for Thai food at our favorite Thai-Vietnamese eatery. Fujin is our favorite Chinese and as neighbors we appreciate these families for the hard work that they do for us, day in and day out. The cuisine was excellent as usual, with two of the dishes customized per customer requests. The home crew was cooking up a storm when I left, with Lindsey on her drum machine. There's been a bumper sticker in the neighborhood urging the rehumanization of music ("drum machines have no soul" it says), but I don't see it as either / or. My basement is suitable for drum machine rehearsals, a lot of which are done on headphone. Plus having a driving beat track already laid is what gives the keyboard track rails to run on, with the voice a more epiphenomenal track and last to be recorded. I outlined a number of policy goals for the near future on PHYSLRNR, which may have a public archive, not sure. I joined that list on invitation of Bob Fuller. I tend to focus my energy there in bursts, mostly lurking. A "policy goal" is of generic significance in this namespace and might mean some ground rule about the house and grounds, or a planned scenario of wider scope. My involvement in encouraging more inter-mingling in the context of performing useful social services is hardly new. LAAP had a lot of that (that was our AFSC Latin America Asia-Pacific program, of which I was clerk for many years). The various neighborhood households continue to weave a pattern with ours. I only found out recently that the Lotts were helping take care of the cat, which has been turned loose to roam freely. She's thrived so far, and has an entrance through the foundation to the music studio, still a base, though she's not really well trained enough for such an environment (somewhat feral and uncivilized -- this isn't Moon, who died some years ago). I'm supposed to start filing financial aid papers for colleges soon. I was basically low ebb for two years, with the small business retired from much local contracting as I sought to honor bank obligations. Carol paid the 'rent' in exchange for living here part time, a very generous contribution. Walker donated the maxi taxi. We lived out of dumpsters, figuratively speaking (OK, sometimes figuratively -- lots gets wasted in America) and depended on Food Not Bombs to keep us afloat. Those days are not over, even though I'm now getting regular electronic deposits from Sebastopol (see online c.v. for more details). The CSN work is voluntary for all of us, which is in the nature of start-ups, plus this is an open source / transparent endeavor and so follows a different emergence pattern. On my radar are Bob Fuller (in recovery) and his family, and Suzanne (also friends with Alex) who lost her uncle. Our family lost Eve Lightfoot recently, the daughter of Elsie, my grandma Esther's sister and the mother of my cousins Alice and Mary. In the Meeting, we lost Simeon Hyde, a stalwart supporter and leader within our Multnomah Friends. We also remembered Bill Sheppard and George Hammond recently, wanderers and treasured persons among us. At lunch today, I brought some pictures from our Parliament of World Religions trip in 1999 around this time of year. We celebrated New Year's in Maseru, Lesotho. Dawn did a workshop with the Dalai Lama in Durban. He later joined the conference to deliver a keynote. His Holiness also met with a bunch of us in the Cape Town parliament building, and was introduced by Deputy Defense Minister Nozizwe Madlala-Routledge, a Friend and our host at the time. I shared some good New Year's Eve time with another alum from the International School. Ms. Tomasi (as she was then known) was not in my class and had been in the Philippines much longer when I got there in 1971. She and I knew many people in common nonetheless. Thanks to FaceBook, we were able to make time in our lives to visit Back Stage at The Bagdad and catch up and compare notes. Expats from overseas school backgrounds should get together more. We help the world stay a little less crazy in my view (and each other), not unlike the Parliament of World Religions, yet even more eclectic.